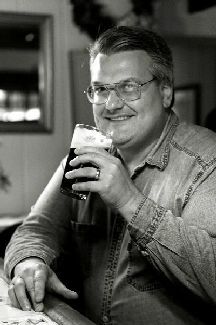 As we begin this New Year of 2010 I decided it would be a good time to pay some homage to that captain of the American brewing industry - namely, the King of Beers, Budweiser, and to its gargantuan producer, the ubiquitous Anheuser Busch. Now, you may think that I may be pandering a bit here. 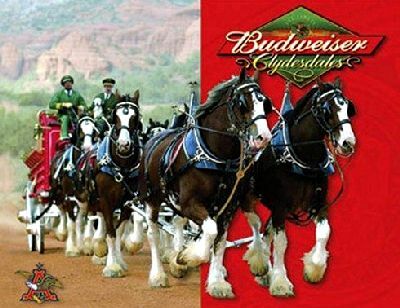 After all, doesn't Anheuser Busch and its products get more than enough attention elsewhere already? Certainly you can't get through a Sunday afternoon of football without being assaulted by a plethora of Busch ads. Perhaps I should be concentrating all of my attention on all of the wonderful microwbrewed beers that are out there, which are often begging for some precious publicity. But make no mistake - the fact plainly is that all of those microbrews might not be getting brewed today if there wasn't a strong American beer culture intact in the first place. There is no doubt that many years ago, Adolphus Busch and his product laid the groundwork for beer's sacred place as the great drink of the common masses, and the beverage of moderation in American life. Modern beer snobs might like to snicker, but the truth is that Anheuser Busch produces an amazingly consistent product. It is a strict attention to the brewer's science that allows a Busch beer brewed in California to taste exactly like one that is brewed in New Jersey. That is no small feat, and anyone who has operated a chain of brewpubs and has attempted to brew the same beer in all locations knows this. Busch beers are brewed to appeal to a wide spectrum of consumers, and they are good for what they are - clean and true. It should come as no surprise that some of the earliest drinking experiences my life came at the hands of Anheuser-Busch products. I fondly remember chugging an eight-pack of Budweiser “nippers” as part of my ritual introduction to beer drinking back in my late teens (when it was still legal to purchase alcohol at the age of eighteen). On a Delaware River canoe trip back in 1980 that is best remembered for my brother and his friend repeatedly attempting to capsize my vessel, it was a six-pack of “Bud” that hung by a chain into the river, where the icy water currents would keep the beer cold and ready to drink. Budweiser gets it famous light “snappy” flavor largely from two sources - one is the introduction of rice into the mash at a rate of somewhere over forty percent in relation to the barley malt, and the other is the special yeast culture that leaves a clean, if slightly fruity impression on the tongue. As I grew older, I also came to appreciate the Busch line's super premium product, Michelob. This beer has a special place in my heart for it was the brew I was swilling the evening I met my wife Nancy in a nightclub. With Michelob in hand, I resolved to turn around and initiate a conversation with the lady standing closest to me at the bar - and the rest is history. Ah, the treasures of beer lore. However, it was still several years before Anheuser Busch was to make its greatest impression upon me with regard to my interest in brewing. A little over twenty years ago my wife and I spent a year living up in the snowy confines of New Hampshire. We had modest jobs and lived pretty simply, since the disposable income was rather hard to come by. 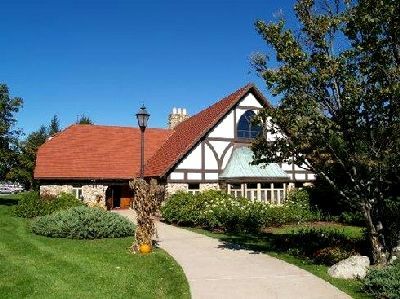 We were always looking for inexpensive ways to entertain ourselves, and we landed a good one when we discovered that there was (and still is) an Anheuser-Busch brewery situated in the nearby town of Merrimack. Needless to say, it is a large and gorgeous brewery, although it is actually small relative to some of Busch's larger plants. On a number of otherwise boring Saturdays we would drive down to Merrimack to take the guided tours. It was on these tours that I experienced my great conversion to all things beer. The tour guide carefully explained the brewing process from the initial mash in right through fermentation and the cold aging of the beer, and then finally the bottling process. Listening to this while gazing awestruck at the huge kettles and tanks, while inhaling the delicious scent of cooked barley malt hanging in the air, made me want to go home and try to imitate this process on my own. I might also add that we were each treated to three twelve-ounce samples of incredibly fresh draught beer at the end of the tour. Often my wife and I would joke that we needed to come to come to the brewery armed with disguises so that we could sneak through the tour several times in a day, and thus get to drink more free beer. We never actually got around to doing that, but the impression left on me by those tours led to my eventually taking up the hobby of homebrewing, which I enjoyed for many years.